The Europe neurological disorder drugs market has been anticipated in a report by Transparency Market Research (TMR) to uphold a consolidated nature as small companies have been researched to secure a strong share. A maximum amount of revenue had been bagged by five leading companies of the market in the recent past: GlaxoSmithKline plc, Novartis AG, AstraZeneca, Bayer AG, and Merck & Co. Most of these companies have been foreseen to lay emphasis on building up their pipelines with multiple drug class and extending their regional reach. TMR has prophesied the Europe neurological disorder drugs market to rise at a 6.4% CAGR during the forecast tenure 2016-2024. By the completion of the forecast tenure, the market could be valued at a US$32.0 bn. By disorder, the market has been projected to witness the dominance of cerebrovascular disease taking a lion’s share while expanding at a 6.9% CAGR. By country, Germany had achieved a king’s share of the market in the recent years and has been prognosticated to continue staying in the driver’s seat in the near future. It could expand at a 6.8% CAGR. 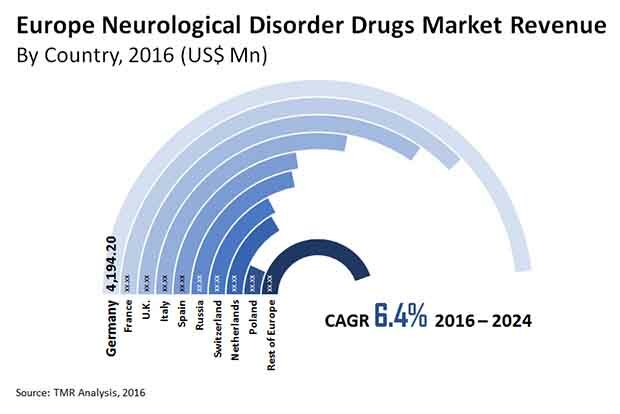 The Europe neurological disorder drugs market has been foretold to experience a rise because of a number of pharmaceutical firms tapping into its significant growth potential after being prompted by the staggering increase in brain-altering disorders. The growing need to manage various diseases such as multiple sclerosis, cerebrovascular, Parkinson’s, epilepsy, and Alzheimer’s could bode well for the growth of the market. Several innovative drugs are in the making to manage such diseases with support received from swelling investments in the market. In the foreseeable future, the Europe neurological disorder drugs market could testify a strong boost in its growth due to the rising count of clinical trials. Market growth has also been prognosticated to gain from the increase in the size of the geriatric population. Rising count of patients with headaches, migraines, and strokes could increase the demand in the market owing to the increasing requirement of drugs for cerebrovascular diseases. Treatment of neurological disorders could be extortionate because of a number of additional expenses related to hypnotic and sedative, anticholinergic, and antiepileptic drugs. Moreover, development of drugs seemed to have slowed down because of the expensive cost involved in research and development. The Europe neurological disorder drugs market could be restricted because of the maturation of product portfolios owing to the decline in innovation. Furthermore, strict policies for prescribing sedatives have been predicted to put a negative impact on the market. However, escalating prevalence of neurological disorders has been projected to create opportunities for growth in the Europe market. Governments along with support groups have been increasing awareness about neurological disorders and their treatment in the region. This could also act as a factor of growth for the Europe neurological disorder drugs market. Players focus on strengthening their pipelines with multiple drug class. Decline in innovation results in mature product portfolios, thus limiting growth.